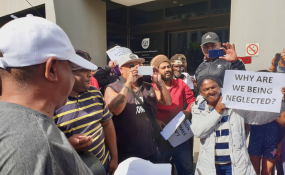 Cape Flats residents picketed outside the Western Cape Department of Human Settlements office on Wednesday to demand houses. Parkwood residents blocked Prince George Drive on Wednesday afternoon. This followed a picket by several communities in the morning outside the Department of Human Settlements in Wale Street, Cape Town. Tensions ran high as the protest leaders demanded to see Western Cape MEC Bonginkosi Madikizela outside his offices. The crowd of about 50 people came from Parkwood, Retreat, Philippi, Hout Bay and Ottery. Picket leader and Parkwood resident Paul Philipps told GroundUp, "Our demands are already known by the department. We are not here today for a repetition. They must just honour their promises and respond to the demands of the people. And the demand is one simple sentence: Provide decent housing for our people." Philipps said their constitutional rights were being violated and they were being robbed of their dignity. Howard Soetwater from Crestway in Retreat said, "We occupied a piece of land in Retreat about two years ago. Some of the people have been on a housing waiting list for more than 20 years. We want housing. We are sick and tired of all the promises. And if we are not given these houses we will not vote. It is as simple as that. We have no services, no electricity, no toilets and no water." Placards with words "Why are we being neglected? ", "We want houses" and "The power of the people is stronger than the people in power" were waved in the air. One of the picketers spotted Western Cape Minister of Community Safety Alan Winde. He was on his way to his car when residents rushed over to him. He agreed to address the residents, but said he was not clued up about their demands and was rushing to a meeting. He said he would relay a message to Madikizela and tell him to come and address the picket. Resident Regan James from Hangberg, Hout Bay, said, "Our people have lost their eyes fighting for houses. We have been promised countless times that we would receive housing. We have ended up building our own houses because we cannot wait anymore!" Madikizela did not come out to address the residents. They were eventually addressed by department head Thando Mguli, much to the disapproval of the picketers. Mguli who had a hard time addressing the crowd because they wouldn't let him speak, saying "Julle lieg te veel (You lie too much)" and "Julle vat ons communities vir 'n gat (You take our communities for asses)". Mguli said housing projects were in place for Philippi and Mitchells Plain, and the department was still looking for land to house the people from Hout Bay. With regards to Parkwood, he said the community leaders knew that the department was hard at work to find a solution for housing in the area and plots had already been identified for housing. At about 2pm, hours after the picket dispersed, Parkwood residents started burning tyres along Prince George Drive. Speaking to GroundUp, Philipps said, "We are now burning tyres in response to the non-response we received when we were outside Human Settlements this morning. We are not planning any violence, but people are angry and I cannot say that there ultimately won't be any violence. We want answers!"